(Beyond Pesticides, March 20, 2019) In a second verdict against Bayer/Monsanto yesterday, a jury found unanimously that a California man’s non Hodgkin lymphoma (NHL) was substantially caused by the herbicide glyphosate (Roundup). The case being heard in federal court in San Francisco now moves to the damages phase. Last August in San Francisco Superior Court, a California groundskeeper was awarded $39 million in compensatory damages, and $250 million in punitive damages in a case that linked his NHL to Monsanto’s glyphosate/Roundup. In October, the judge in the case upheld the verdict, but reduced the award to $78 million. 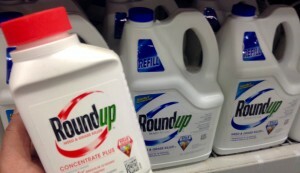 According to the Associated Press, the trial judge, U.S. Judge Vince Chhabira “is overseeing hundreds of Roundup lawsuits and has deemed [this case] and two others ‘bellwether trials.“ The case was brought by Edwin Hardeman of Santa Rosa, CA. He said he had been using Roundup since the 1980’s. During the trial, according to The Guardian, Judge Chhabria, “approved Monsanto’s request to prohibit Hardeman’s attorneys from raising allegations about the corporation’s conduct, saying issues about its influence on science and government were a ‘significant … distraction.’” This set up a limitation that required the plaintiff’s attorneys to focus solely on studies linking the chemical to cancer risks. Despite the prevalent myth that this widely-used herbicide is harmless, glyphosate (N-phosphono-methyl glycine) is associated with a wide range of illnesses, including NHL, genetic damage, liver and kidney damage, endocrine disruption, as well as environmental damage, including water contamination and harm to amphibians. Researchers have also determined that the “inert” ingredients in glyphosate products, especially polyethoxylated tallow amine or POEA —a surfactant commonly used in glyphosate and other herbicidal products—are even more toxic than glyphosate itself. Monsanto, manufacturer of glyphosate, formulates many products such as Roundup™ and Rodeo™ and markets formulations exclusively used on genetically engineered (GE) crops. Glyphosate, one of the most widely used herbicides in the world, due in large part to the increased cultivation of GE crops that are tolerant of the herbicide. Since EPA’s classification of glyphosate as a Group E carcinogen—or “evidence of non-carcinogenicity for humans,” the International Agency for Research on Cancer (IARC) in 2015 classified glyphosate as a Group 2A “probable” carcinogen, which means that the chemical is probably carcinogenic to humans based on sufficient evidence of carcinogenicity in experimental animals. As of July 7, 2017, glyphosate is listed as a cancer-causing chemical under California’s Safe Drinking Water and Toxic Enforcement Act of 1986 (Proposition 65). This requires cancer warning labels be placed on end-use glyphosate products in California. Newer scientific studies have also looked in greater depth at glyphosate’s mode of action and the implications for human and ecological health. Glyphosate works by disrupting a crucial pathway for manufacturing aromatic amino acids in plants—but not animals—and, therefore, many have assumed that it does not harm humans. However, many bacteria do use the shikimate pathway, and 90 percent of the cells in a human body are bacteria. The destruction of beneficial microbiota in the human gut (and elsewhere in and on the human body) is, therefore, a cause for concern—and a major contributor to disease. In addition, the destruction of soil microbiota leads to unhealthy agricultural systems with an increasing dependence on agricultural chemicals. Assessing the mode of action of glyphosate, scientists have found that it starves and sickens the very crop plants that it is supposed to protect. It is dangerous to base the review of chemicals on the assumption that microbiota is irrelevant to assessing dangers. This entry was posted on Wednesday, March 20th, 2019 at 12:25 am	and is filed under Bayer, Cancer, Glyphosate, Monsanto, non-Hodgkin's Lymphoma, Uncategorized. You can follow any responses to this entry through the RSS 2.0 feed. You can skip to the end and leave a response. Pinging is currently not allowed.